These heartbreaking photos from the days before labor unions and labor laws reveal just how hard our forefathers had it. 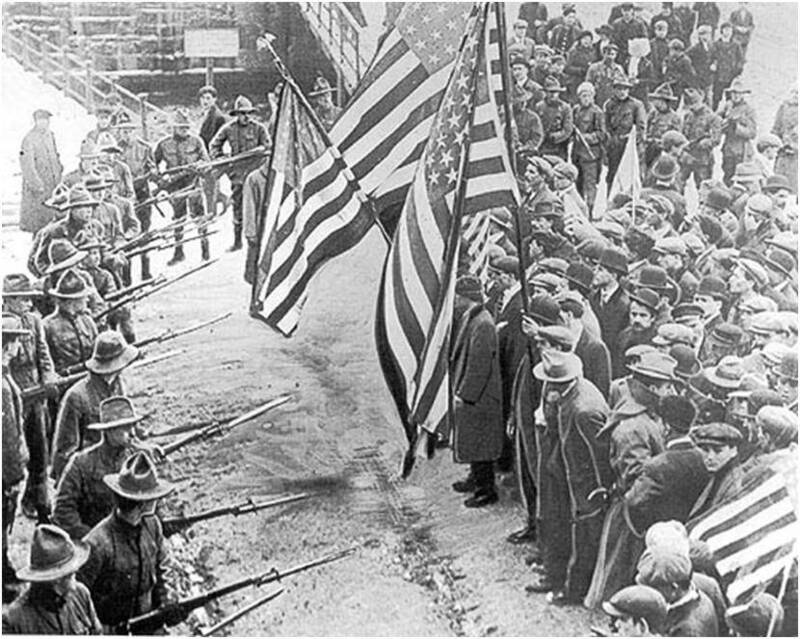 A standoff between strikers and the militia during the "Bread and Roses" strike. 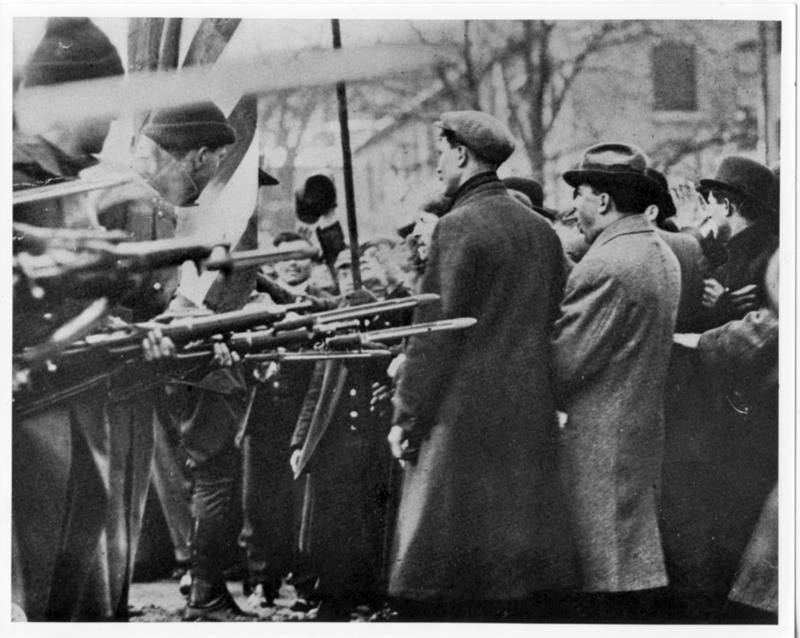 Militamen surround the Lawrence Mills strikers, armed with bayonets. Three of the strikers would not make it out alive. One young boy would die when a soldier put a bayonet in his back. 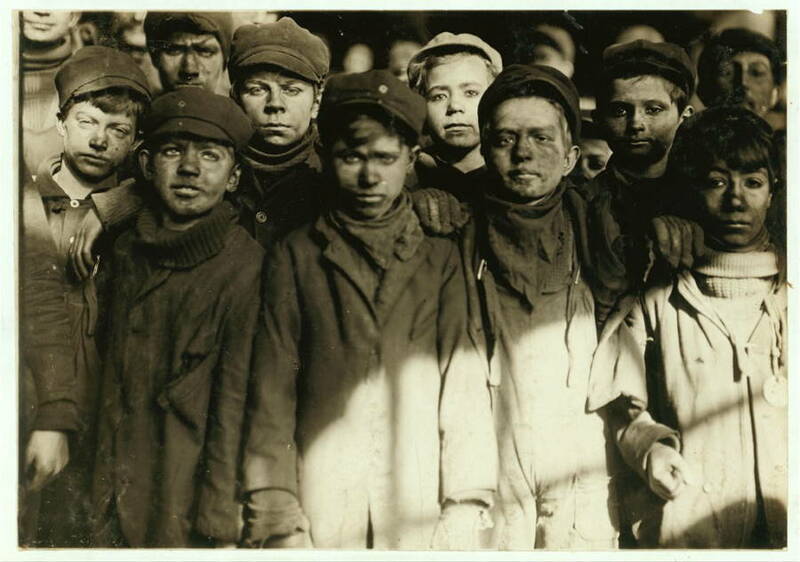 A group of child laborers stand in a coal mine. Union members flee as a policeman arrests a striker. 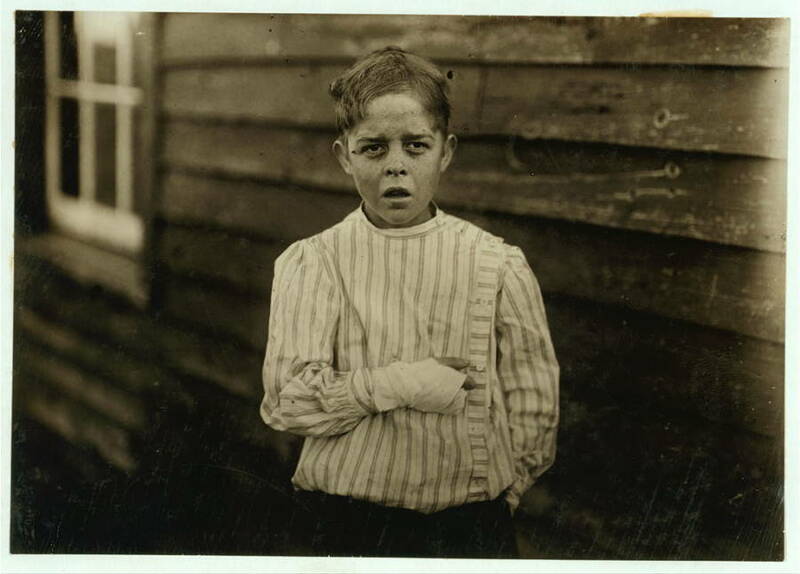 A young worker shows the injury he sustained at the mill. His aunt complained to the photographer, "Now he's jes got to where he could be of some help to his ma an' then this happens and he can't never work no more like he oughter." Children work in the textile mills in Lawrence, Massachusetts. Workers at the textile mill, on average, made 15 cents an hour. To get by, most had to put their children to work as well. Coal miners meet to debate whether they should go on strike. Note the number of children in the crowd. The Triangle shirtwaist factory burns. The workers were unable to escape. They had been locked inside to keep them from taking breaks. Bodies of workers who jumped from windows to escape the Triangle shirtwaist fire lie on the ground. 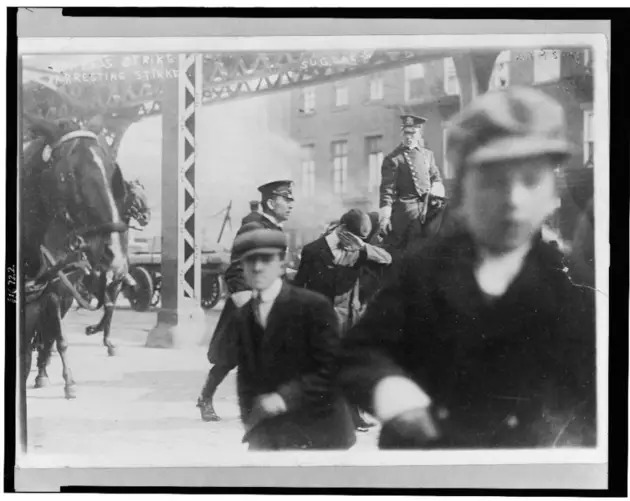 The Triangle shirtwaist fire victims are placed into coffins. After the fire, labor unions take to the streets, demanding that the policies that kept the victims trapped inside be changed. Child laborers at the Lawrence Mills. Strike-breakers open fire on a group of striking workers. In the scuffle, 15 people would be seriously wounded and one would die. Wounded strikers, after a violent confrontation with strike-breakers, waiting for an ambulance. 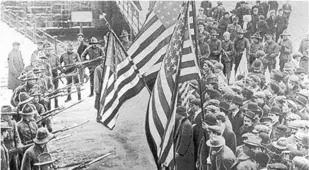 Silk workers on strike march down the streets of Paterson, New Jersey, calling for an eight-hour work day. The police come out to maintain the peace during a union strike. Estelle Poiriere, a 15-year-old girl who sliced open her finger in a card machine, at work at the mills. Young drivers work deep inside a coal mine. Becky Edelson leads a group of workers in a hunger strike against the unfair treatment they've received working for the Rockefellers. 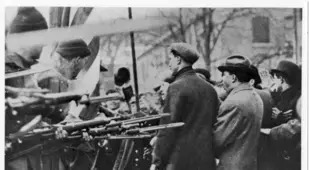 The Rockefellers send out the National Guard, with rifles ready. In the end, some 20 people will die. On the other side, the coal miners of the Ludlow Colony stand on strike. A Ludlow Colony worker tries to rescue his fallen friend, who's been shot by the National Guard. Workers, at the close of the Ludlow Massacre, wave a white flag, begging for a moment's peace to collect their dead. Days after the Ludlow Massacre, activist Becky Edelson is arrested for "disorderly conduct" for protesting the slaughter. With the massacre over, the families left alive scavenge through the ruins of the Ludlow Colony for the last ruined pieces of their homes. A funeral procession for those killed in the Ludlow Massacre marches through the town. A child of cotton pickers, suffering from malnutrition, listens as her parents debate whether to go on strike for better wagers. Their strike will fail and nothing will change. The entrance to a coal mine where children work under incredibly dangerous conditions. A worker shows off the costume they use to keep first aid workers safe when they descend into the coal mines. 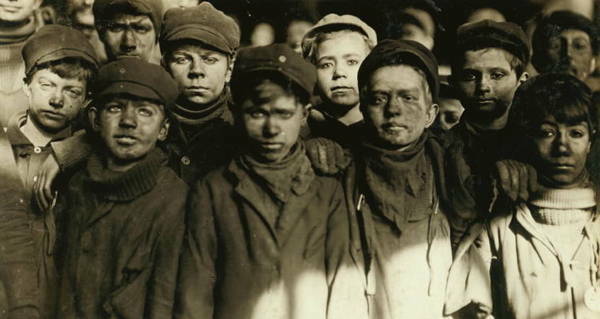 The photographer, Lewis Hine, distributed this photo to show how dangerous this coal mine was for the children who worked there. A group of child laborers at the Lawrence Textile Mills, where the "Bread and Roses" strike was staged. The children of the Lawrence Mills textile workers. As the parents were preparing to strike for a living wage, they didn't know how to support their children. Many sent their kids to sympathizers in New York, who took them in as temporarily displaced orphans. 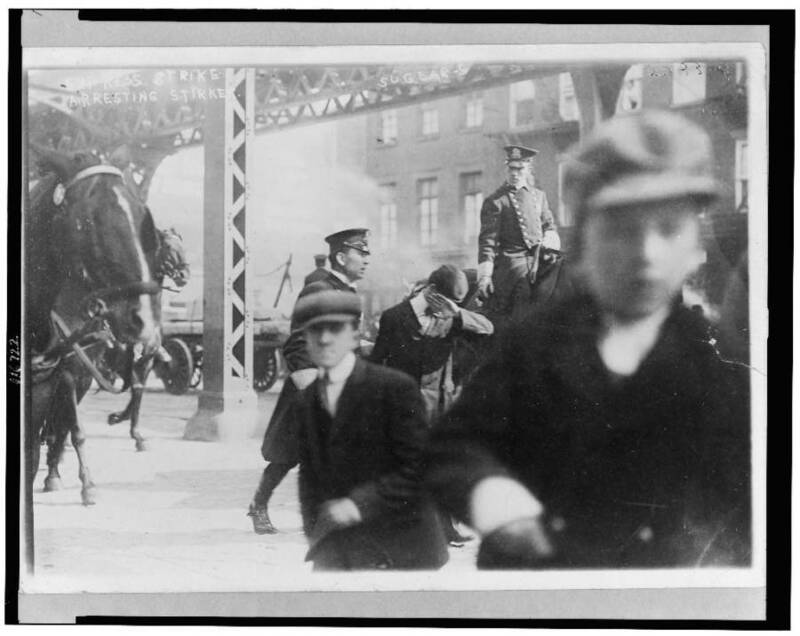 The children who worked in the Lawrence MIlls textile factory, on strike alongside their adult co-workers. Armed men patrol the streets of Lawrence during the strike, looking for troublemakers. The Lawrence Textile Mills workers crowd into an intersection. Days later, the same streets are filled with armed militiamen. The militia surrounds the striking workers, guns pointed and ready. The funeral of Felix Baran, one of 12 slaughtered in Everett by the police for going on strike. The workers at the Lawrence Mills take to the streets. Three would die and nearly 300 would be sent to jail, but they would get their demands: a 54-hour work-week. In the time they lived in, it seemed like a luxury. The eight-hour work day didn’t come easy. It took people who were willing to stand up and fight for it. It took unions of workers who were ready to face the rifles of militiamen and refuse to go home. 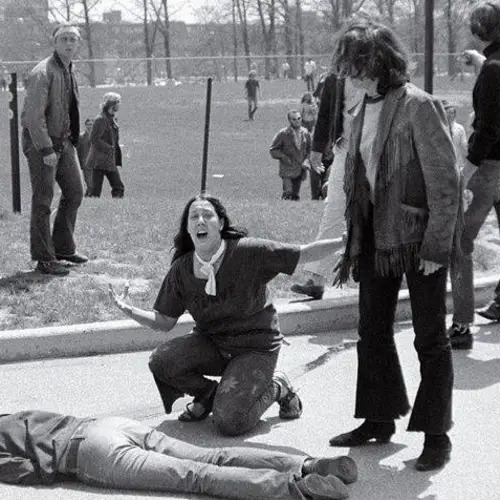 It took people who were willing to spill their blood and give their own lives to make the United States a place where a family could get by without sending their children off to work in the factories. Going to work in the 19th century was a different and far more dangerous experience that it is today. During the industrial revolution, American laborers would work 70 hours a week or more for mere pennies. The little they earned was rarely enough to feed a family. And so, to put food on a family's plate, wives and children would be forced to come along to the factory and slave away as well. These children would work in incredibly dangerous conditions. Typically, one in every four child laborers was injured in the workplace; some getting their fingers caught in the grinding machines or getting burned in an explosion in the depths of a coal mine. As early as 1832, labor unions across the U.S. started calling for an end to such abuses, demanding that “children should not be allowed to labor in the factories from morning till night” – but it took more than 100 years of strikes and protests before minimum ages of employment became a federal law. One of the worst labor disasters in U.S. history took place at a clothing factory in New York in 1911. The Triangle shirtwaist factory caught fire, with the workers – some as young as 14 – stuck inside. To keep them from taking breaks, the managers had locked the employees in. The workers, unable to break through the doors, were trapped in the burning building. Some, in desperation, leaped out of the windows. Others stayed and burned. By the time the fire was out, 146 people were dead. At this point, many decided that they’d had enough. After the fire, labor unions across the city went on strike, demanding their right not to be locked inside their factories. In Lawrence, Massachusetts, a year after the Triangle shirtwaist factory fire, more workers took a stand. At the time, most employees at the textile mills made 15 cents an hour — not enough to feed a family. “When we eat meat it seems like a holiday, especially for the children,” one worker said. It was no exaggeration: The children in Lawrence were so malnourished that half of them died before they turned seven. When the factory cut their wages, they stood up and went on strike. Their demands were basic: They wanted to cut their work down to 56 hours a week and earn an extra two pennies each hour. Still, the governor sent the militia in, armed to the teeth, and let them open fire. Three died, and one of them, 20-year-old John Ramey, was run through with a bayonet while he was trying to run. After Lawrence, coal miners in Ludlow, Colorado, fought back next. 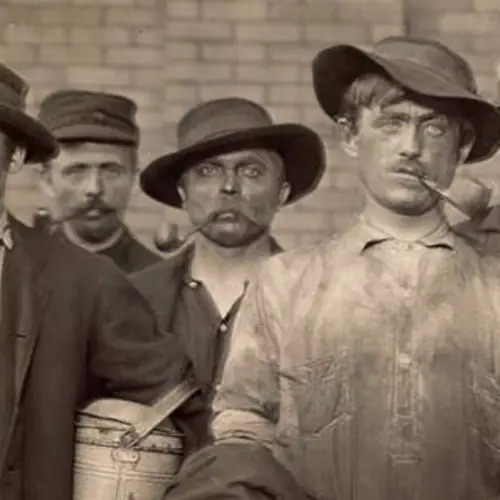 The men were dying inside the mines at alarming rate – their job had twice the fatality rate of other mines in America. Their union demanded an eight-hour work day and that the mine follow Colorado law. John D. Rockefeller Jr., the mine’s owner, sent in a private detective agency to torment the strikers. 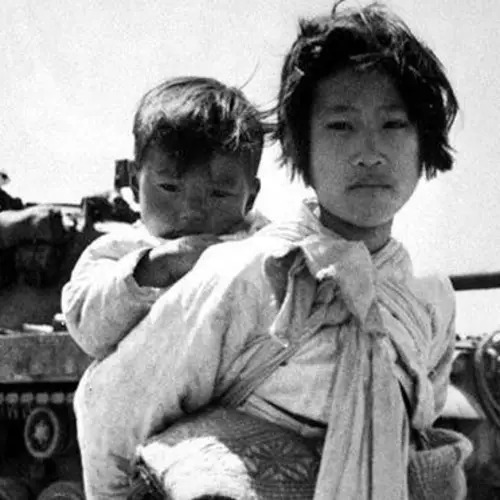 The strike-breakers burned their camps to the ground and opened fire on the workers with a machine gun, slaughtering some 20 people – including one woman who was reportedly pregnant as well as several children. It was one of the worst massacres in the history of the struggle for American labor unions – but as the blood washed off the mines and the smoke faded, the people started talking. Congress' Commission on Industrial Relations started campaigning for an eight-hour work-week and the end of child labor. It’s an all too often forgotten chapter in American history. But it’s how a living wage was won – by men, women, and children in labor unions who spilled their blood to give the next generation a life they could live. 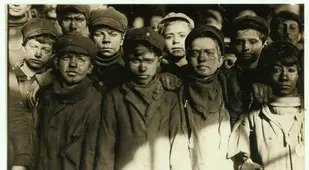 After this look at labor unions, check out these incredible Lewis Hine photos from the era of child labor.